Love is power. In “An Ordinary Woman,” Victoria wants Albert; everything else pulls against it, in all directions, with the dual gravity of politics and time. Albert wants a title and an income. Parliament wants somebody who’s not so very German (and Catholic-adjacent). Lehzen wants to be primary confidante again. Melbourne wants a mulligan on the last time he and Victoria talked about feelings. And Uncle Leopold, whom nobody asked, wants to make sure Albert doesn’t settle for less than $50 grand a year, since he assumes Albert will need it—that’s mistress money. That’s not quite as insulting as it sounds; at some point or another in “An Ordinary Woman,” almost everyone, our heroine included, assumes that one thing Albert doesn’t want is Victoria. But we at home aren’t particularly worried about that one. 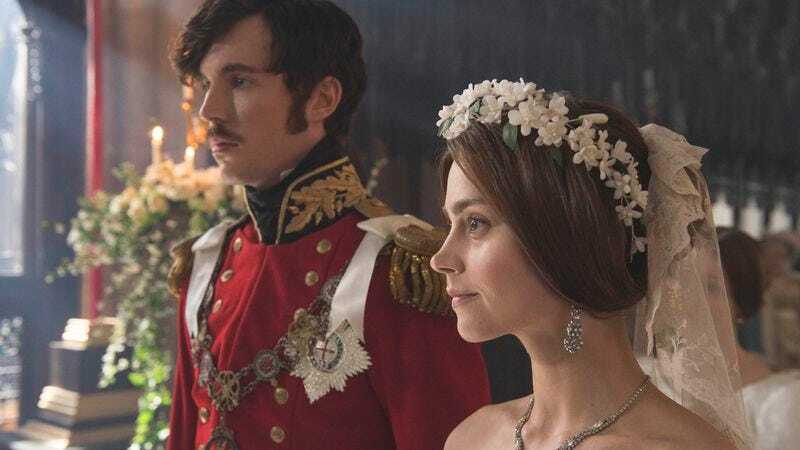 After the longing glances of the last episode, it’s clear Victoria’s not aiming to make this romance a fulcrum for pathos about the corrupting weight of rule, the tenuous shadow of monarchy, and the impossibility of maintaining a private life in a public sphere. You don’t use the camera to follow your furtive young couple behind columns and tree trunks unless you’re trying to evoke romance; Victoria’s just here to photogenically get us tangled up in their knots. “An Ordinary Woman” tries to tug on all the strings the series has laid out. We’ve seen Victoria refining her attempts to get involved in policy and learning the limits of her power; we’ve seen how the men around her try to shape her and the ways she pushes back or gives in. And all of that comes into play amid the first gasps of a love affair operating under some intense foreshadowing. That foreshadowing is key. Knowing what comes next (even in the broadest and most generous strokes, we know Victoria increasingly relied on Albert to handle her affairs, and the pair of them cloaked their political interests with public reserve), these early power struggles in their relationship are setting the stage for a tumultuous marriage. Half this episode’s energy seems expended on Albert’s ambivalence in the face of increasing dismissal from the British government, and occasionally from Victoria. By the time he delivers the sharp “Peevish? This word I do not understand—perhaps I should ask my new secretary to translate it for me,” even Victoria knows they’re in for some fights. The layer of cynicism the older generation slathers on all the peripheral advice provides the episode’s most interesting tension: It’s entirely possible for every adult to wish them well and still assume that this infatuation is a temporary convenience. It’s interesting, if a little unsatisfying, how hard Victoria and Albert’s romance is framed as something set apart from this cycle. This is politics, and love is power. Sure, young love is great—just look at all the fog machines you get to run through!—but we can’t help but understand Alex Jennings’ blissfully unsubtle Leopold, reminding us that every gasp of young love could easily become the emotional asphyxiation of adulthood. That strain lies in wait for the young couple; each of them face a flicker of it here. Jenna Coleman has been very careful not to make a saint of Victoria. Her pearl-clutching at the revelation that practically every man she knows had a mistress feels a bit willfully naive after so long in the British court, but Coleman grounds Victoria in dread that the adults assume a mistress is inevitable. And Tom Hughes gives Albert the nervous energy of a whippet, whether turning down women at a brothel or contemplating his own fraught family circumstances. And though some of his complaints stem from good old-fashioned insecurity, it’s also clear Albert’s more aware than Victoria of all the things that could go sour. But as with any period piece, it’s impossible to keep the future out. Victoria and Melbourne’s farewell—an “almost,” done with as light a touch as their story allows—isn’t just the parting of a woman and her first love. Melbourne’s been a key figure in teaching her how to navigate affairs of state, and he’s apparently ceding all fields at a time in her reign when Victoria’s comfortable enough to get married, but precarious enough that she’s facing problems on all sides. Going ahead, your investment as a viewer will probably end up being a negotiation between the tangle of power struggles, and how hard the show pushes the idea of romance as an equalizing force. 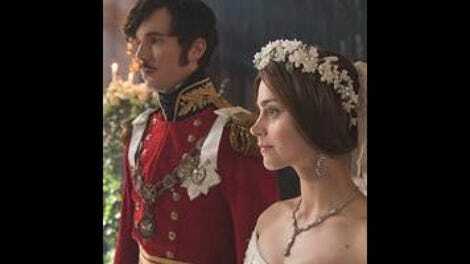 Creator Daisy Goodwin clearly thinks Albert came to the wedding night with genuine fondness, even ardor, for Victoria, which helps make their future slightly less daunting to contemplate. But there’s real gravity in Melbourne’s goodbyes once we realize that Victoria’s stepping away from not just a former flame, but her chief advocate. This episode reminds us she’s made no friends amid the Tory contingent, that plenty of people close to Victoria are attempting to negotiate themselves a piece of the bounty, and that Albert isn’t familiar enough with British government to advise in any particulars. Now all she has is that promise to obey, and she and Albert, alone. Crown Corner: Precedence is a fraught business. Victoria has spent less time hinting at this sort of thing than The Crown did, but turns out that kind of slight is evergreen. Ah, I see Ernest is primed to get a little too close to the Duchess whose name I had to look up. A classic love story! Stay tuned. I would never deny Alex Jennings the chance to be this gleefully slimy, since he’s doing an absolutely amazing job at it and his cynicism is particularly necessary this episode. However, his version of Leopold leaches any leftover fondness out of those “poor dear Charlotte” references pretty cleanly. I’m not (yet) planning to take this show to task for short-changing ties between women, since so much of the narrative so far is pointedly about Victoria negotiating male spaces. But what a telling shot in the departure scene: All the women standing on the stairs in their candyfloss dresses, looking toward the departing men, with empty spaces between them all. Downstairs notes: Penge’s powerlessness as the dresser of his dreams floats out of his life again was as close as he’s come to being interesting; ditto Miss Skerrett’s moment of ambivalence that living a lie doesn’t leave much wiggle room for a love life. And Eve Myles continues to be relieved that she doesn’t have to be a C-rate Downton bad guy any more and can just make joyously appalled faces at everyone instead. Sweet Heaven, When Will Someone Finally Murder Francatelli? : The Victoria Story. “No, no. Well, that usually comes later, ma’am, but—no.” Someone work up a wry, dragged-from-retirement gentleman-spy miniseries and put Rufus Sewell in it, please.